This Franklite Vinci polished chrome 6 light dimmer floor lamp with antique metalwork cage is contemporary, bright and stylish. Featuring circular base and slender stem in bright chrome leading to a central ball, with six radiating lamp bulbs. The lamps are surrounded by a decorative antique finish ironwork cage, with cubes at different angles to create a geometric shape. Fitted with an inline dimmer switch for convenience and ideal for the living room to assist with reading or other task. A class II double insulated table lamp no earth required and suitable for older properties without an earth loop. 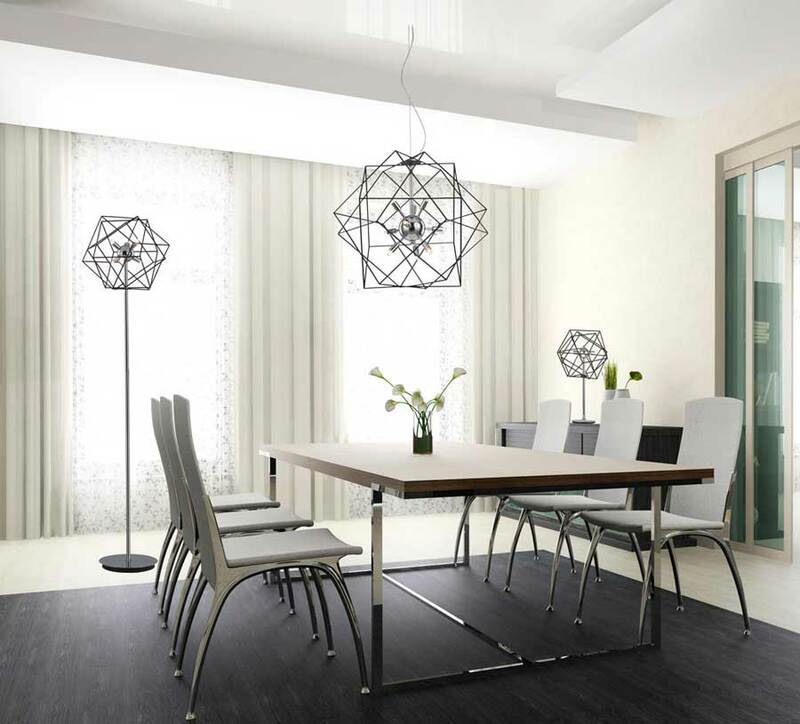 Part of the ultra-modern Vinci lighting collection that includes coordinating nine and six-light ceiling pendants and a table lamp, please scroll down this page to view. This contemporary light is supplied by Franklite Lighting who have been one of the pioneers in the design, manufacture and distribution of high quality lighting such as the Vinci polished chrome 6 light dimmer floor lamp with antique metalwork cage you see here. If you are looking for the perfect floor lamp for your lounge be sure to check out our full range of floor lighting designs. Our lamps come in a good variety of heights so there should be something for every situation in your desired style.